« Is a Reunion With Jim Johnson a Good Idea? Last Friday Matt Wieters surprised many by accepting the qualifying offer the Orioles made him. As a result, he will now be a member of the 2016 Orioles on a one year, $15.8 million contract. That’s not a small amount of money, but it’s surprising he accepted the deal, considering there are no other catchers on the free agent market, leading one to believe that Wieters would have been in line for a large payday had he rejected the qualifying offer. Either he found that the offers he would’ve received were lower than expected, thought he could make even more money on the free agent market after the 2016 season, enjoyed playing in Baltimore (the only organization he’s ever known), or a combination of all three. The situation of Wieters accepting the qualifying offer has already been covered in excellent fashion (as usual) over at Camden Depot. On Monday, Jon Shepherd provided a very thorough and realistic set of options as to where the Orioles offseason may go as a result of this, while Tuesday saw Matt Perez laid out some reasons (in much more depth than what I have above) as to why Wieters may have accepted the qualifying offer. Since the situation has already been covered so well, I won’t be going over any of that in this piece and I suggest that you head over to Camden Depot and read the articles in their entirety. If you read Camden Depot on even a semi-regular basis, you already know that the writers recently participated in an exercise outlining their individual plans as to how they thought the Orioles should approach the offseason, with Jon picking what he ultimately thought would be the best course of action. An index of the entire series can be found HERE. 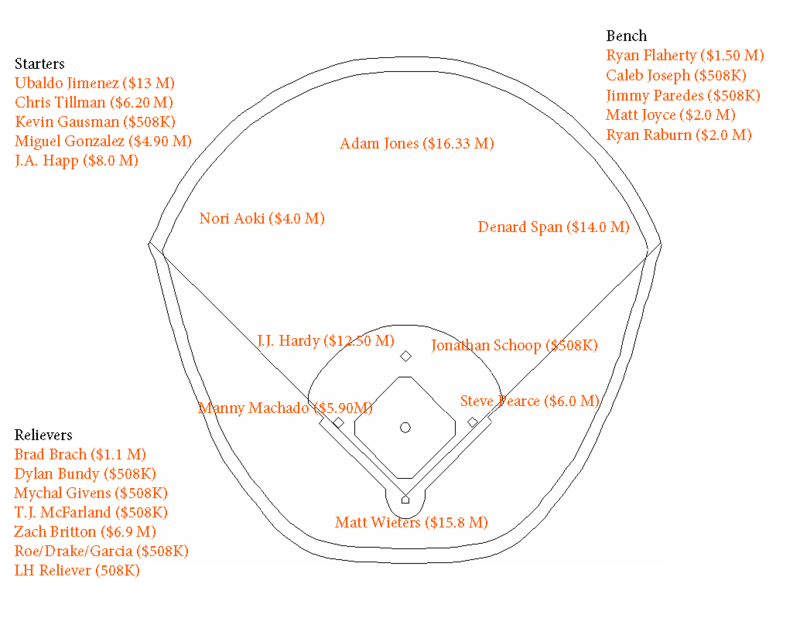 What I would like to do is take another look at my personal blueprint for the Orioles 2016 season, and see how Matt Wieters accepting the qualifying offer (which I did offer him in my hypothetical offseason) changes my strategy going forward. My blueprint can be found HERE (it focused on building major league depth and a minor league system), but below is a quick recap of the free agent signings I would have made. The original assumption was that after paying players currently on the roster, providing raises in arbitration (using the numbers provided at MLB Trade Rumors), and paying league minimum to players who have not accrued enough service time, I would have approximately $44.7 million to spend on free agents. Now that Wieters has accepted the qualifying offer I extended him, that number has decreased to $28.9 million. Let’s see what adjustments can be made while following the same set of rules (which includes NO trades). Originally I did not tender contracts to Paul Janish and Nolan Reimold. That doesn’t change, but now that Wieters has returned, I’m going to add Brian Matusz to that list as I could use the extra money. Matusz is expected to make $3.4 million in his final year of arbitration, so cutting him loose adds an extra $2.9 million to my available funds ($3.4 million less the cost of a replacement making league minimum). The market for left handed relievers is mostly uninspiring at the moment, so we’ll make an assumption that this position will be filled by a minor league free agent signing or Rule 5 draftee. If there is some money left at the end, it will allow us to go after another non-tendered RP (preferably left handed) at a lower rate than Matusz would’ve commanded. All in all, that brings the budget back up to $31.8 million. Chris Davis is even less of a possibility (using this hypothetical budget) now that Wieters is back, so he’s still going to be allowed to leave. Although I would have Wieters spend some time at 1B and DH, I’m primarily going to have him catch, as that’s where I’ll get the most value out of him (a career 98 wRC+ hitter at 1B/DH just doesn’t provide much value). Additionally, with Wieters taking time at 1B/DH, it probably doesn’t make sense to go after Mike Napoli anymore, as he can’t play anywhere else. It was also the general sentiment that a 1 year $5.25 million contract I originally offered to Napoli was too optimistic, so it would have been unlikely that the Orioles would have been able to sign Napoli at that price anyway. With Wieters still spending most of his time behind the dish along with Davis and Napoli no longer in my plans, we’ll still need someone to play 1B on most days. That will be Steve Pearce, who I will resign to a 2 year, $12 million contract, similar to what I proposed in my blueprint series for Camden Depot. The difference here though is that I originally had Pearce as an OF/UTIL player in that scenario, and in this one he is primarily at 1B. Checking on the funds, we now have $31.05 million remaining to spend. In the outfield, I’m still proposing to sign Denard Span for 4 years and $56 million, with that 4th year being a team option (this of course still assumes his medicals come back clean). That will cost the Orioles $14 million annually. Unfortunately, I don’t think that leaves enough room in the budget to re-sign Gerardo Parra given some of the other needs the team still needs to fill after signing Span. With Wieters on the roster, I’ll need to go with a cheaper option in LF than a Parra/Pearce platoon, especially since Pearce is going to be pre-occupied most nights at 1B anyway. Since we’re doing this a month after the original exercise, there are a couple more players available due to options being declined, players being outrighted/released, etc. I’m going to take advantage of this and sign Nori Aoki to a 1 year, $4 million contract to play left field. Aoki’s option for $5.5 million was declined by the Giants earlier this offseason, so it figures that I should be able to get him for a million less than that. That figure may even be on the high side, considering he battled injuries in 2015 (fractured fibula and concussion) and only accumulated 382 PA’s, but still hit .287/.353/.380 and was worth 1.5 fWAR. Aoki hits LHP just fine and in fact, he hits them better than he hits right-handers. Because of that, this won’t need to be a platoon at all. Let’s just give the LF starting job to Aoki and call it a day. So what do we have left to spend now? We have about $13.05 million. For the bullpen, as I stated before, Matusz will have to be replaced either by a Rule 5 draft pick, minor league free agent, or another non-tendered left handed reliever. I’m not sure there is anyone currently on the free agent market who will give the Orioles similar or more production at a lower price, so for now we’ll still assume the minimum salary, which is already accounted for in our budget. The other RHP pitching spot will still be filled internally by Chaz Roe, Oliver Drake, or Jason Garcia. As for the rotation, we’ll stick to the original plan of signing J.A. Happ to a 3 year, $24 million contract, with the 3rd year preferably being a team option ($8 million annually). This will leave us with $5.05 million to spend on two bench spots. Let’s start with the original plan of taking a flyer on Matt Joyce for 1 year and $2 million. He’ll be a good left-handed bat off the bench and provide some insurance in LF if Aoki gets injured. Finally, let’s fill that remaining roster spot with Ryan Raburn on a 1 year, $2 million contract (Raburn’s team option of $3 million was recently declined by the Indians). Raburn is a very productive hitter against LHP (career 122 wRC+), and can play anywhere on the field except SS and catcher (he’s even logged 1.2 innings on the mound!). He doesn’t play any of those positions particularly well except for LF (a 6.2 UZR/150 in almost 2,000 innings), but he can be put at those other positions in a pinch. And if Aoki does happen to be injured or ineffective, you can replace him with a strict platoon of Joyce and Raburn. That leaves the Orioles with a $118.95 million payroll and an extra $1.05 million to splurge on an upgrade to Brian Matusz. Here’s the final tally of free agent signings. And here’s how the final roster shakes out. Looking at this roster, I’m starting to like it more than my original proposal (although Aoki and Raburn weren’t available when the original proposal was written). There is a lot of versatility/positional flexibility here that will allow Buck Showalter to play matchups and also protect the team against injuries and ineffectiveness. Although Raburn should be limited to hitting against LHP, he can basically play anywhere. Wieters can catch, play 1B, or DH. Pearce can play both infield and outfield corners and some 2B. Flaherty can play anywhere in the infield. Paredes can even play a couple positions in an emergency. The team also has a couple of options in the minors such as Dariel Alvarez and Christian Walker if some of these free agents don’t work out. Plus this is all done without giving up a draft pick. Additionally, there is some flexibility to trade some of the starting pitching and/or catching surplus for potential roster upgrades this offseason or in July. Even with Wieters accepting the qualifying offer, there is still a way to build depth on the major league roster to compete in 2016, while still building a farm system. This entry was posted on November 21, 2015 at 11:00 am and is filed under Free Agency, Offense, Offseason, Pitching with tags 2016 Baltimore Orioles, Brian Matusz, Denard Span, J.A. Happ, Matt Joyce, Matt Wieters, Nori Aoki, Ryan Raburn, Steve Pearce. You can follow any responses to this entry through the RSS 2.0 feed. You can leave a response, or trackback from your own site.